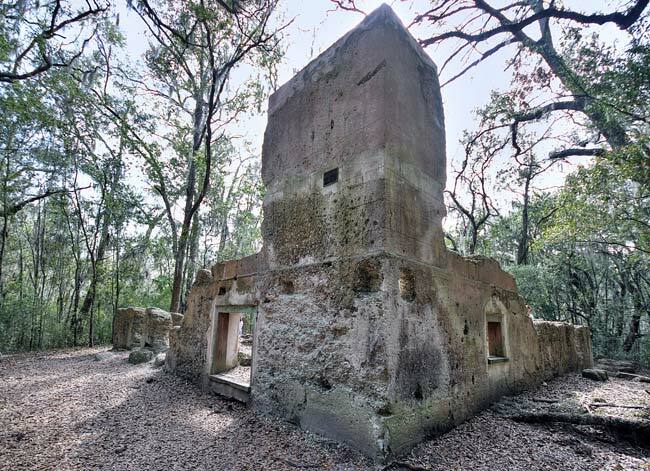 The ruins of this unusual mansion on Hilton Head Island date to the late eighteenth or early nineteenth century. The land was originally purchased by John (Captin Jack) Stoney, who then bequeathed it to his sons, John and James, Jr. The latter constructed the home between 1790 and 1810. 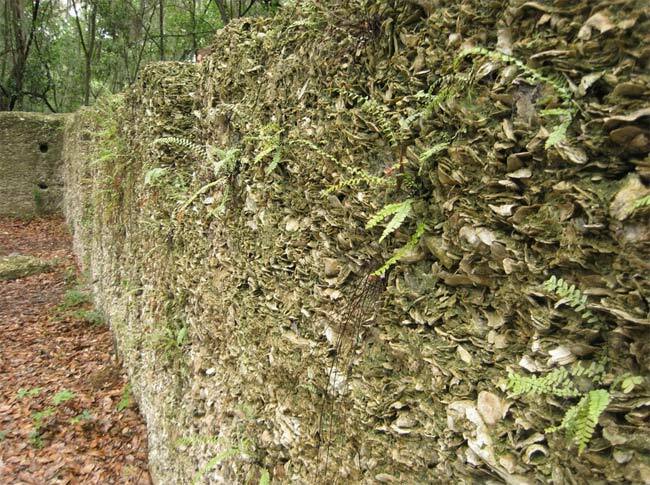 An anomaly among Hilton Head plantation houses, it was built with tabby – a combination of crushed oyster shells, whole oyster shells, water, and lime (seen below). Stoney named his plantation Braddock’s Point for Captain Dave Cutler Braddock, commander of the half-galley Beaufort. On the surrounding property is also the foundation of a tabby slave dwelling used by house slaves (seen below); field slaves lived closer to the fields on a slave “street,” or row of slave houses. The chimney of another structure also stands in proximity to the main house, likely the overseer’s quarters. The Stoney brothers – John, a merchant in Charleston, and James, a planter – worked as business partners in the operations of Braddock’s Point, though the business ended in economic ruin. The details of the failed plantation remain unclear, but John Stoney died in debt in 1838. At the time, he was the sole owner of the property, having outlived his brother. Braddock’s Point was subdivided and sold off to pay John Stoney’s creditors; much of it was purchased by individuals and the Bank of Charleston, to whom Stoney mortgaged his property prior to his death. The Bank of Charleston sold this portion of the property to William E. Baynard in 1845, and it remained in the Baynard family until Federal occupation of Beaufort County during the Civil War. Union troops used the plantation and its home as a headquarters during the war, though it was redeemed by heirs of William E. Baynard in 1875. The house burned in 1869, prior to the Baynards’ reacquisition if it. The Baynards were never able to restore the property to its former glory, as the rice industry collapsed after the war due to the loss of slave labor. The property then changed hands several times before being acquired by the Sea Pines Plantations Company in the latter part of the twentieth century. 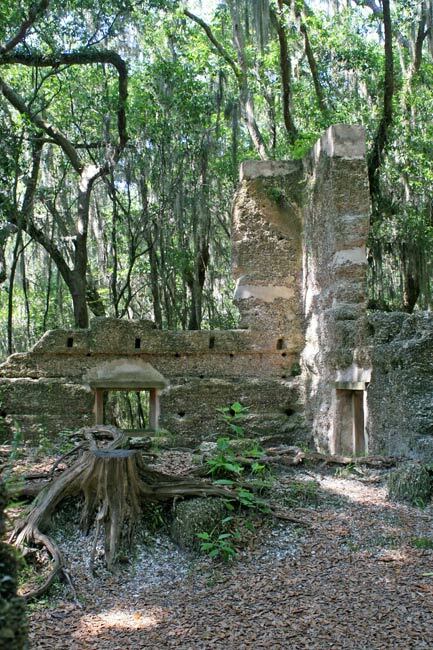 The company developed the land into a residential area, preserving the plantation ruins. 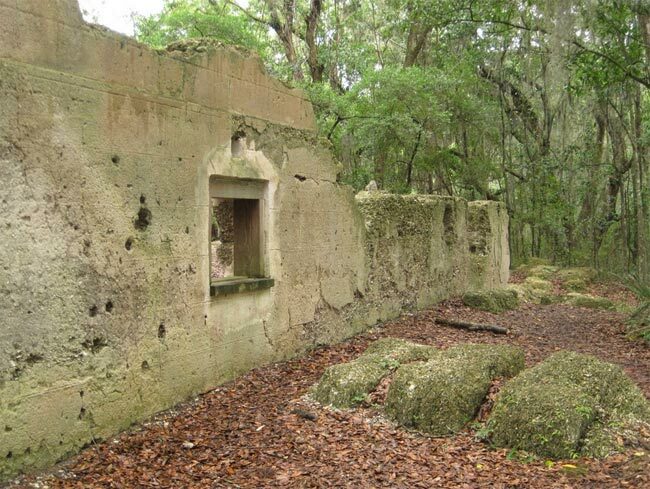 The homeowners of Sea Pines Plantation now maintain the former Braddock’s Point Plantation, allowing for periodic archaeological digs. 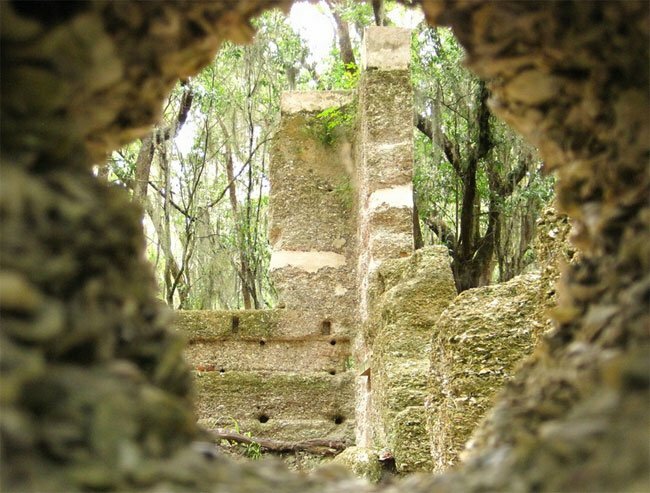 The site of the ruins are open to the public in a six-acre green space called Baynard Ruins Park. 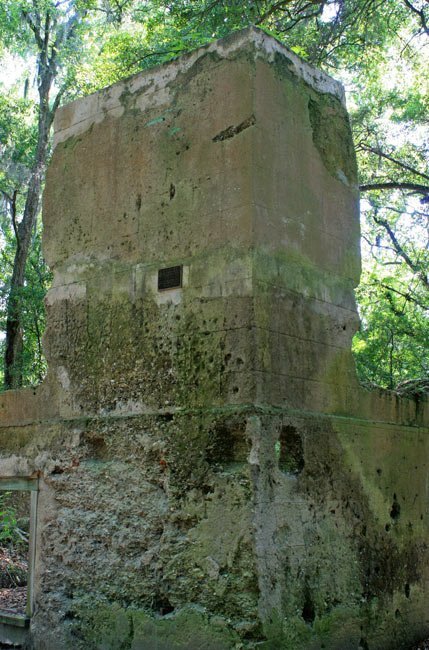 (Baynard Ruins; Braddock’s Point Plantation) The Stoney-Baynard Plantation, dating from the first decade of the nineteenth century, or perhaps even the last decade of the eighteenth century, represents the main settlement of a typical sea island cotton plantation. The site is significant for the contributions it has already made, and is able to make through additional archaeological research, to our understanding of main plantation complexes and their white owners. In addition, the site provides the opportunity to explore the status and life style of African American slaves associated with household domestic duties, rather than field slaves which have been more extensively studied. Taken as a whole, the complex has the ability to further refine our understanding of the use and cognitive structure of rural plantation landscapes by both black slaves and white owners. 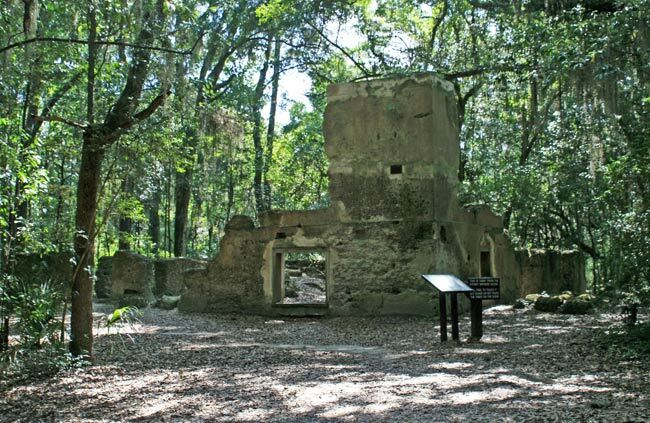 Finally, the main house ruins are the only tabby mansion built on Hilton Head Island. 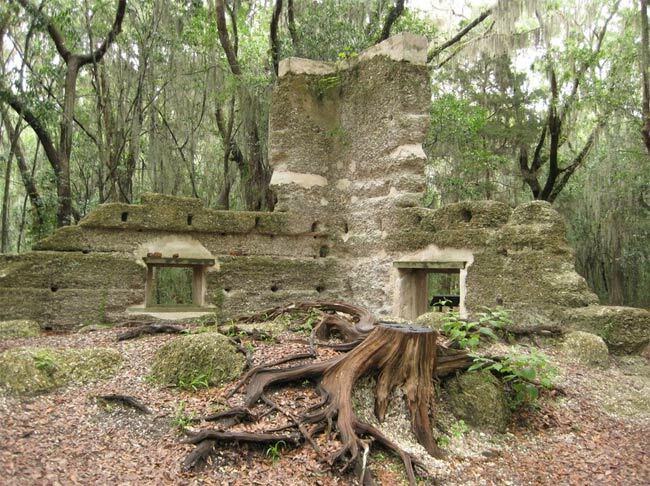 Standing architectural ruins associated with the plantation include portions of the main house, a chimney footing for what may be an overseer’s house, and a slave house associated with slaves working in the main house. 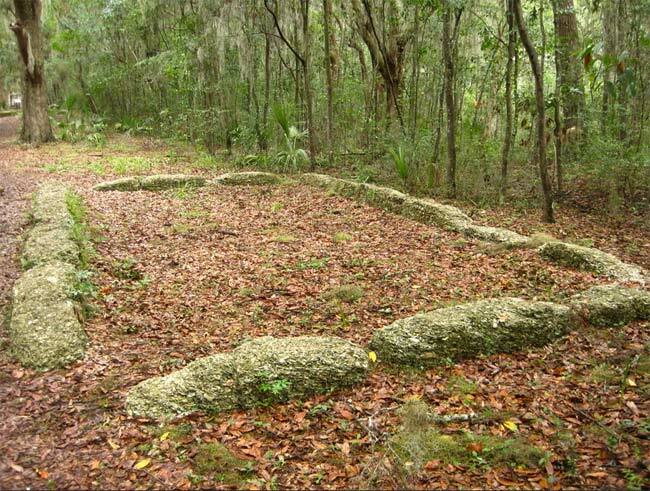 Ruins of a fourth structure include footings for a tent, probably constructed during the Civil War by Union troops known to have been stationed at this plantation. Easy to both, you can simply put Stoney Baynard Ruins into Google Maps and it pulls right up and takes you directly there. The address is also located at the bottom of this article, hope this helps! How is easy is this to find? How accessible is it?